We are also experts in repackaging to suit customer requirements. We can repack sizes from one litre through to 1,000-litre IBCs — and everything in between. Call us on (02) 9756 2315 or e-mail us to see how we can repack product for your business. Our compact, state-of-the-art manufacturing and storage facilities are unique in being able to handle a vast array of products. Being close to Sydney’s geographic centre and near two major arterial roads is a bonus. We’ve grown by building on our successes, year by year. And we’ve done that by being able to source an expanding array of good quality products. And we mean it. In fact, we pride ourselves on it. Special orders are just that: our specialty. A customer wanted a carpet-cleaning product with particular ingredients, which we sourced. The product had to be rubbed in with a broom. We don’t normally stock brooms, but could we get him the brooms as well? Absolutely! Clean carpets; happy customer. A company specifically wanted toilet paper in a different ply to those commonly sold. We got them paper with that ply. Relieved customer. A club wanted us to source sanitary bins because we were supplying all their other cleaning products. Sanitary bins aren’t in our product range, but our “we can do that” response and delivery made them yet another happy customer. … there are many, many more examples like these of how we’ve been able to help our customers with special orders, as well as with more regular orders. It means they get top quality products speedily, without having to deal with numerous suppliers. It’s quick, simple and effective. 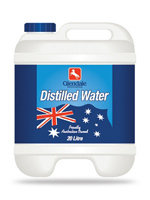 In 1927, Algernon Stoneham set up The Australian Distilled Water Supply Pty Ltd in bustling Regent Street, in one of Sydney’s busy industrial areas. Business was brisk, as the uses for distilled water were many — in vehicle batteries, steam irons, humidifiers, vaporisers, autoclaves, sterilisers and a host of other industrial equipment. As the business grew, it moved a couple of times, until eventually ending up in its current home at 1/75 Newton Road, in western Sydney’s Wetherill Park, right near a major arterial junction. A name change in 1962 to Glendale Chemical Products also reflected its growing product range. Fast forward to 2005, and brother and sister Trent Stoneham and Brooke Duggan bought their father and uncle out of the family business that had originally been set up by their Great Grandfather, Algernon. From the time he was a tiny five-year-old, Trent wanted to join the business, and spent all his school holidays learning the ropes. He finally joined in 1989 — as soon as he could leave school. Brooke deliberately worked outside the family company to begin with, giving herself a strong business grounding. Buying the business was an exciting move, as the pair had grown up living and breathing it, and going in to work in the school holidays. Their plans were to build on its strengths and expand its capacity — and that’s exactly what they’ve done. Brooke and Trent also changed the name to Glendale Packaging in 2005, to reflect that the business deals with the full gamut of cleaning, industrial and pool products as well as solvents, And of course, distilled water. The name reflects that repackaging is a strong part of operations and honours the company’s history. Brooke and Trent are very proud of their company’s history and achievements. They’re also driven to continuing its success well into the future. Having dealt with Glendale for many years, we have always found their service fast, friendly and efficient. Their fast service means we don’t need to carry massive stock levels, and are able to fill our customers’ orders with confidence. Their product range is extensive and of premium quality, which gives us peace of mind our customers are receiving the best quality product. Plus, their empty 20L drums make great chook houses! We service over 8,000 general medical practices, specialists, aged care facilities and hospitals, so product quality is crucial for us — and quality supplier delivery-performance is mandatory. We’ve been trading with Glendale Packaging since 2009, and their prompt attention to our order deliveries facilitates smooth running in our business. Plus, they’ve always welcomed any improvements we’ve requested. 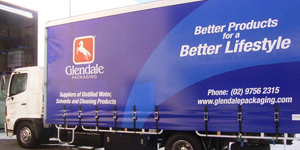 Glendale are one of SSS Australia’s valued supplier partners. We’ve dealt with Glendale Packaging for 25 years because they are a great company, with great service. If they say ‘it will be there tomorrow’, I know I can rely on that. For a small business, in a very competitive sector, that makes a big difference. I can confidently tell my customers when something will be here and they don’t have to go elsewhere. On top of that, where other businesses may buy pallets, we can buy say 10 of a product from Glendale, and they’ll still give us a good price. It means we don’t need to hold so much stock — again, very helpful to a smaller business to remain sustainable and competitive. Like we do with our customers, at Glendale you deal with a person, not just a number; it really makes the business relationship smooth.